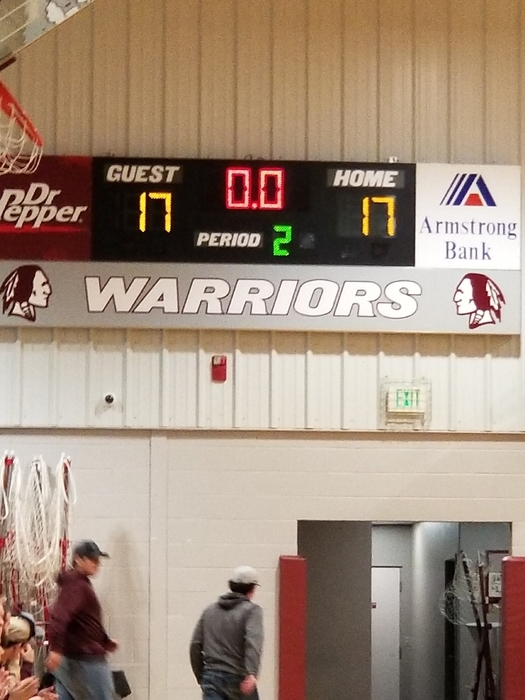 The Lady Warriors’ season comes to an end with a loss to Red Oak, 18-6. It has been a great year for these ladies, and a tremendous four-year run for our seniors. I am so proud of all of you! DISTRICT SOFTBALL UPDATE: Red Oak 22, Lady Warriors 14. We will be playing Indianola again in about 10 minutes. DISTRICT SOFTBALL UPDATE: Lady Warriors 12, Indianola 0. (Run rule, 3rd inning) We will play Red Oak around 1. 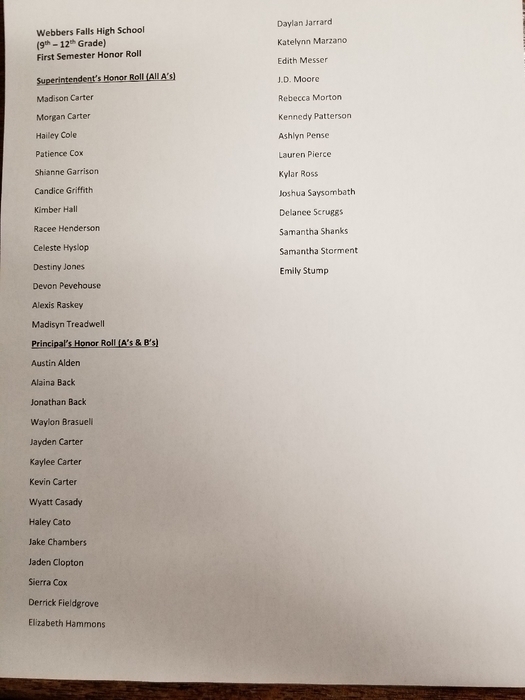 The JH softball team will be playing in a one day festival at Braggs on Monday, April 29th. This is the schedule. 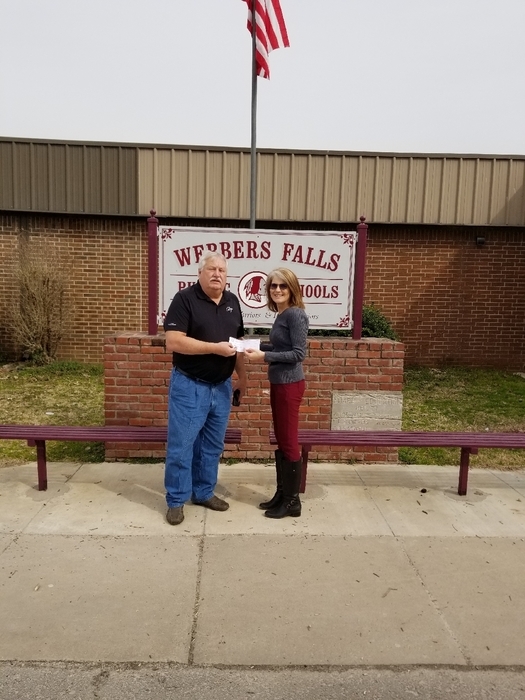 A special thanks to Diamond Gutter Company (Ronnie & Angel Davis, parents of Teralynn and Laina Colston) for donating snacks for the students of Webbers Falls Schools. Your generosity is greatly appreciated! Samantha Shanks does it again! She placed 2nd in the 100 meter dash and 2nd in the 200 meter dash at the Okemah track meet today. Great job! Mrs. Johnson will offer free homework help on Tuesday-Friday... that's all four days... from 3:30-4:30. 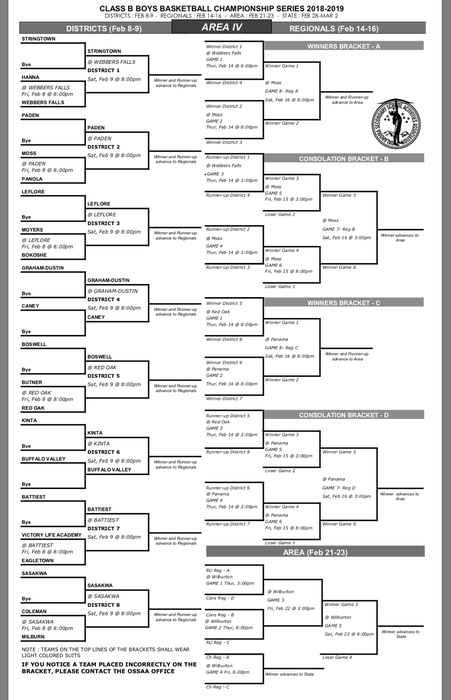 Baseball districts are this Thursday, April 18th, at Cameron. Our boys play at 11 and 1. CORRECTION ON JH BASEBALL GAME: The JH baseball game will be here, next Tuesday, April 23rd, at 5:00 p.m. against Porum. The baseball games are here today instead of at Gans. 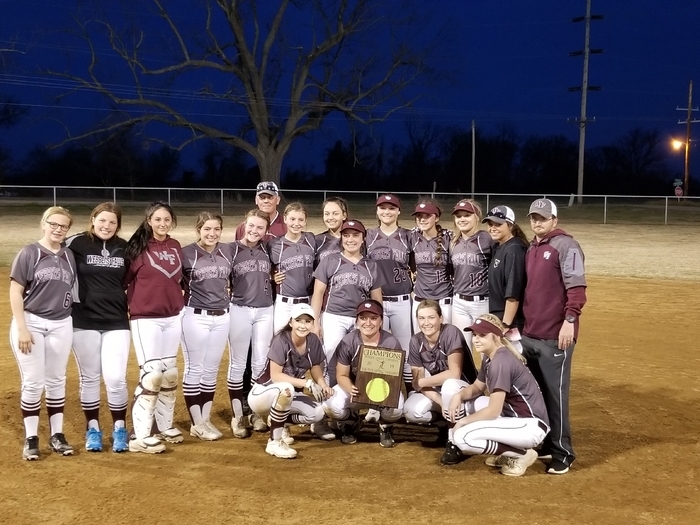 District Softball Update: The districts at Red Oak will be played Wednesday instead of Tuesday due to the inability to get umpires for Tuesday. Softball games are still on for today. We will play junior high, high school, and JV in that order, starting at 4:30 p.m. 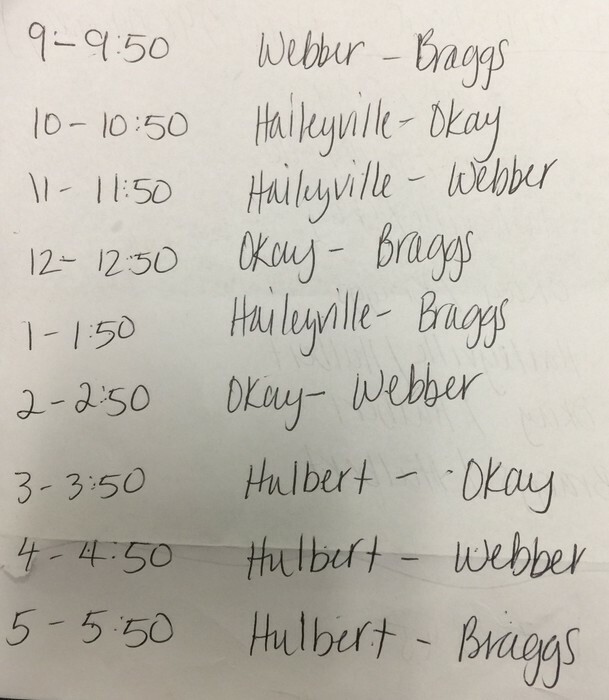 The districts originally scheduled for Thursday have been moved to tomorrow (Tuesday). We still play at Red Oak. We play the second game- around noon. Congratulations to Shianne Garrision! 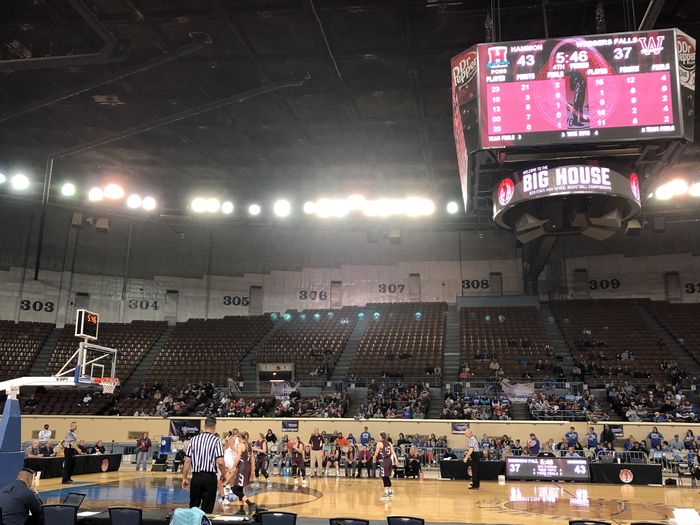 She has been named All-State by the Oklahoma Girls Basketball Coaching Association. This is a great honor that she will share with many preceding Lady Warriors. Our last Lady Warrior All-Stater was Amanda Burris in 1998. Tradition returns! Priority Enrollment at Connors for incoming Freshmen begins April 23. Concurrent Enrollment for Summer and Fall begins April 29. Enroll as soon as you can to get the class schedule you want. Concurrent students will need a counselor permission form before enrolling. The softball games today will start at 4:30 p.m. We will be playing a varsity game then a junior varsity game. Both games are against Gans. Varnum will not be attending today. Free math tutoring this week 4/8 and 4/10-12 (that's Monday, Wednesday, Thursday, and Friday) in Mrs. Johnson's room from 3:30-4:30. 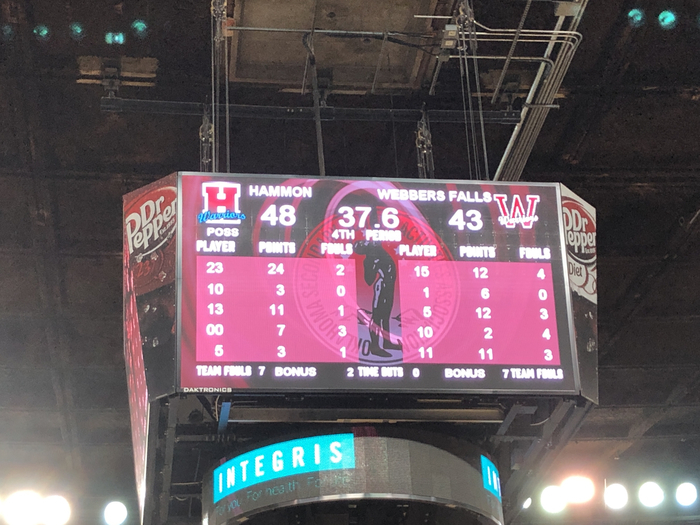 Congratulations to the Lady Warriors! Conference Tournament Champions! WARRIOR PRIDE!!! The Gore/Webbers Falls Ministerial Alliance donated snacks and drinks so that every student, 3rd-8th, who took a state test could have at least one snack before or after testing. We greatly appreciate this donation! If there are other individuals, businesses, or organizations in the community who would like to donate snacks, we will gladly accept them. Thank you for your support! Baseballs games at Arkoma are still on for today. We will be one of the host sites for the conference softball tournament today. 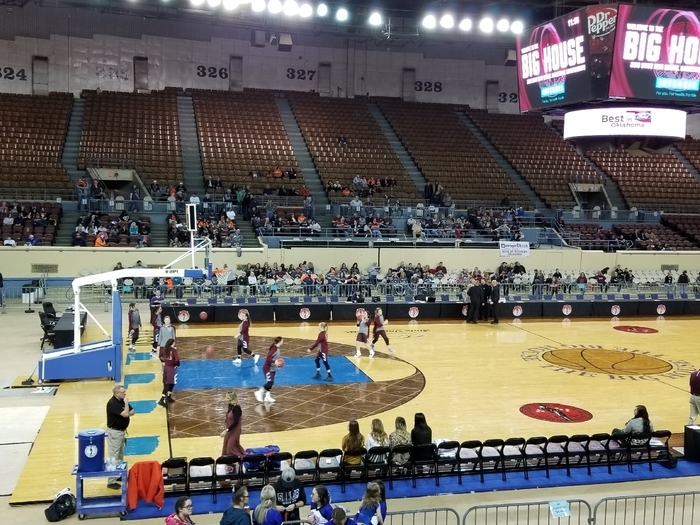 Our girls are scheduled to play at 2:45, 4:00, and 5:15. However, if games finish early the next game will begin before the scheduled time. The teams playing today besides WF are Gore, Gans, and Okay. All baseball games for today, Thursday, April 4th have been cancelled. All softball games for today, Thursday, April 4th have been cancelled. 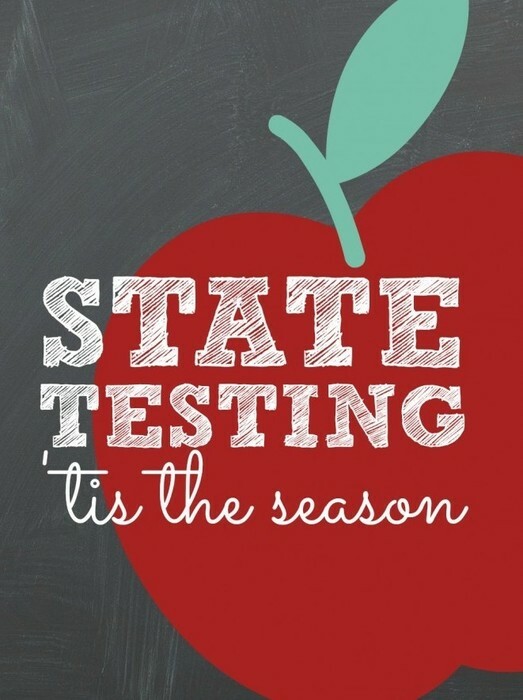 State testing time is here for students in grades 3 through 8. as well as grade 11. Eat a big breakfast and come prepared to do your best. And please PLEASE don’t be absent! 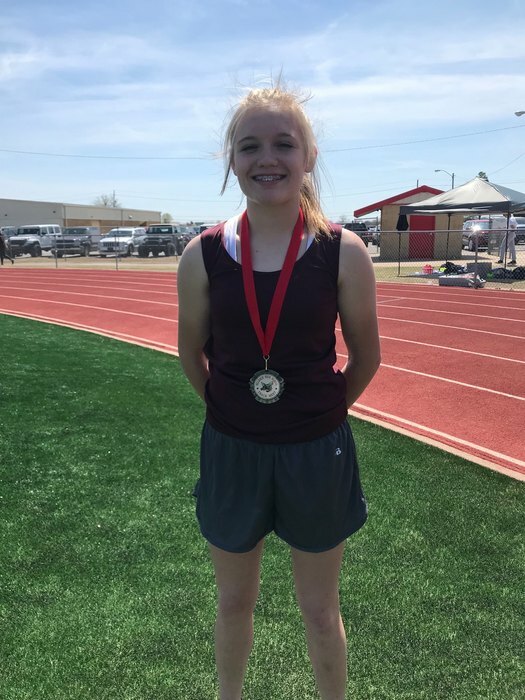 Congratulations to Samantha Shanks for placing 2nd in the 200 meter run at the Hilldale track meet today. She came in 5th in the 100. This track meet features schools from all classes, so she was competing against runners from much bigger schools. This was her first ever track meet, too. Amazing!!!! The softball games this Thursday will be against Watts only. (Kinta will not be attending.) We will play a JH and HS game. On Tuesday, April 9th, we will be hosting a HS 3-Way with WF, Gans, & Varnum. We are scheduled to begin at 4:00 p.m. on both dates. The baseball game that was scheduled to be played at Graham today will now be played at Webbers Falls. It will start at 4:00 p.m. 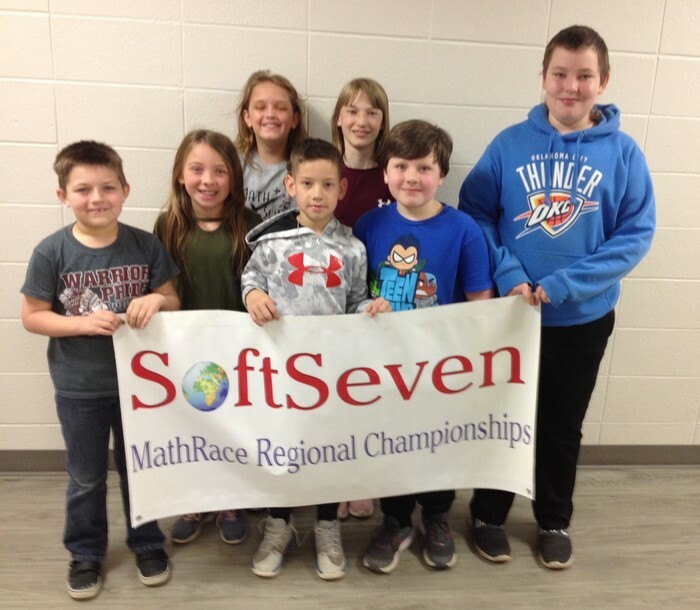 The following students competed at the Soft Seven Math Race Regional Championship: Karsen Paschal, Hope Stiles, Chandler Cramer, Elliott Kunkel, Hayven Shanks, and Cheyanne Herrier. CONGRATULATIONS to Elliott and Cheyanne for advancing to the State Competition! 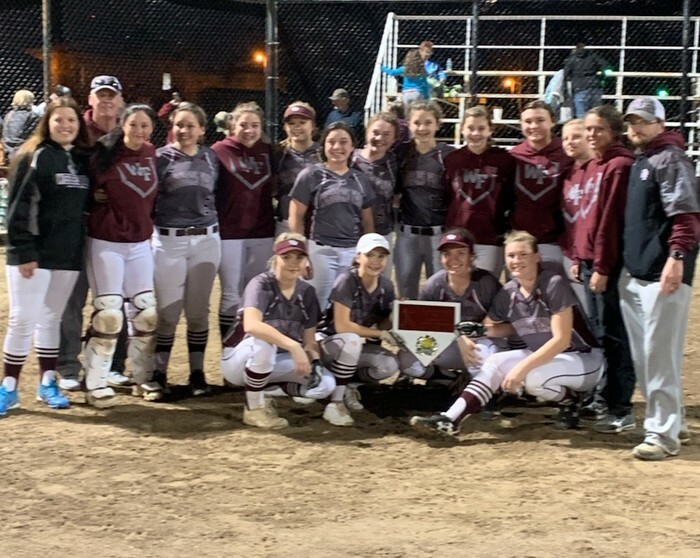 Congratulations to the Lady Warriors for winning the Webbers Falls Slowpitch Tournament. A big thank you to Gans Public Schools for allowing the tournament to be held at your fields because of our wet fields. WARRIOR PRIDE!!! Parent/Teacher conferences will be from 3:30-9:30 p.m. on this date. Third nine weeks grade reports will be available during this time. Beginning March 25th, the Monday after Spring Break, the city will be closing Fourth Street (road West of the Ag Barn). The city will also be closing Weatherly (road South of the School) from Commercial (the old 64 highway) to South Stand Watie Blvd. (the road between the school and the Event center). The anticipated time for the closing will be 30 days. Student Pickup Line: Take Commercial Street to Smith Street. Turn South on Smith Street (street West of baseball fields) to Weatherly. Turn West (right) on Weatherly and follow to South Stand Watie. Turn North (right) and wait for your child in the pickup line. PLEASE DO NOT USE THE EVENT CENTER PARKING LOT FOR STUDENT PICKUP. Student Pickup During School Hours: Follow the instructions for the Student Pickup Line but enter the Staff Parking lot and go to the building to sign out and pick up your student. We are sorry for this inconvenience but are grateful that the City of Webbers Falls is resolving the sewer problems that have occurred over the last several years. CORRECTION ON PREVIOUS POST: The date that the work will begin on Fourth Street will be March 25th, the day we will be returning to school from Spring Break. My apologies for the error. Beginning May 25th, the Monday after Spring Break, the city will be closing Fourth Street (road West of the Ag Barn). The city will also be closing Weatherly (road South of the School) from Commercial (the old 64 highway) to South Stand Watie Blvd. (the road between the school and the Event center). The anticipated time for the closing will be 30 days. Student Pickup Line: Take Commercial Street to Smith Street. Turn South on Smith Street (street West of baseball fields) to Weatherly. Turn West (right) on Weatherly and follow to South Stand Watie. Turn North (right) and wait for your child in the pickup line. PLEASE DO NOT USE THE EVENT CENTER PARKING LOT FOR STUDENT PICKUP. Student Pickup During School Hours: Follow the instructions for the Student Pickup Line but enter the Staff Parking lot and go to the building to sign out and pick up your student. We are sorry for this inconvenience but are grateful that the City of Webbers Falls is resolving the sewer problems that have occurred over the last several years. SPRING BREAK, March 18th - March 22nd, NO SCHOOL Have a safe and blessed holiday! 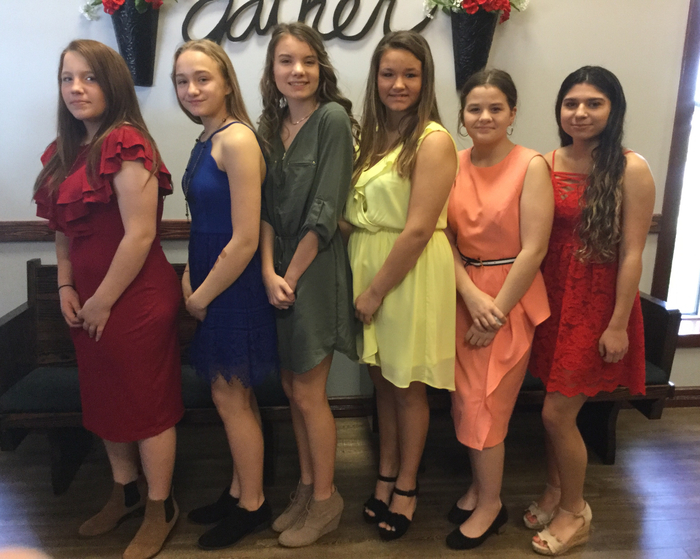 Looking stylish, the seventh grade girls attended the annual Spring Tea at Checotah Free Will Baptist Church. 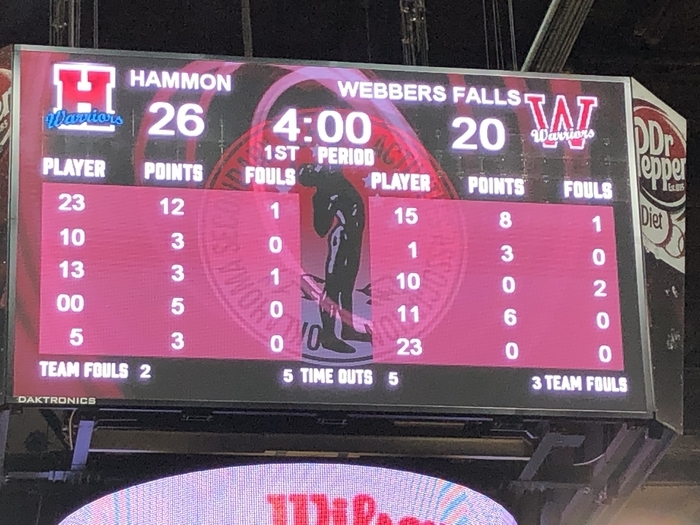 Webbers Falls Schools and the Lady Warrior Basketball team would like to thank Councilman E.O. 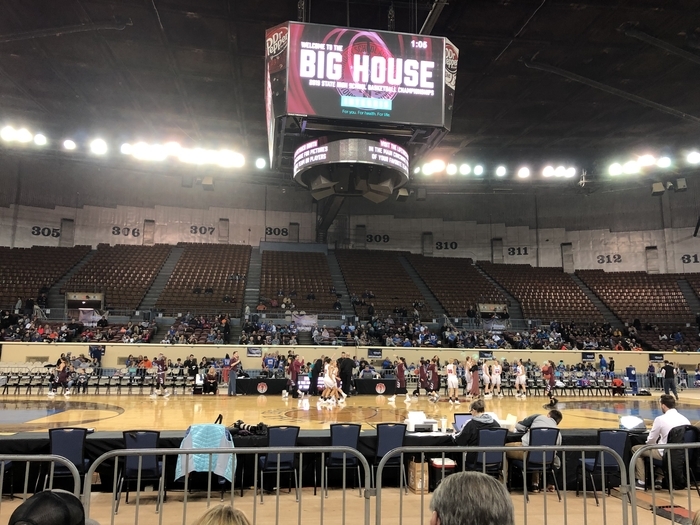 Smith and Cherokee Nation for the generous donation and support in their quest for gold. 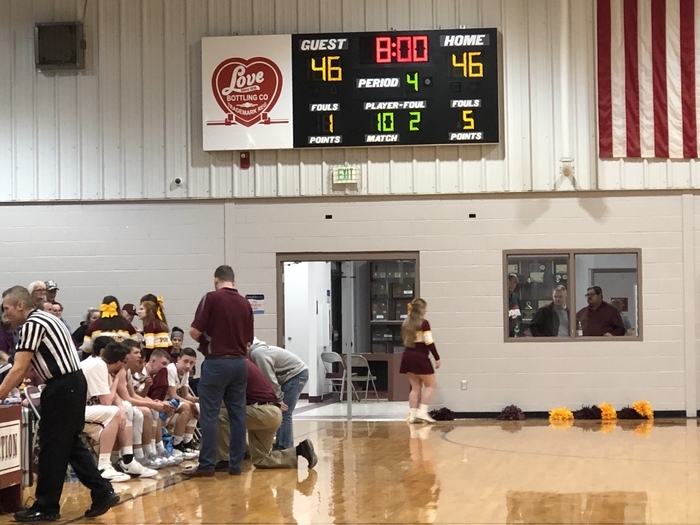 Webbers Falls Public School is accepting applications for a Boys Basketball Coach with other coaching and/or teaching responsibilities for the 2019-2020 school year. A certified application may be downloaded from the school website. Please send Letter of Application, Application –Authorization for Background Check, Resume, Letters of Reference, Transcripts, and Teaching Certificate to Lisa Ward, preferably via email attachments to lward@webbersfalls.k12.ok.us or PO Box 300, Webbers Falls, OK 74470. For questions please call 918-464-2334 (school) or 918-618-2057 (cell) or email the above address. Webbers Falls Public School is an equal opportunity employer. Congratulations Maddux Shelby! 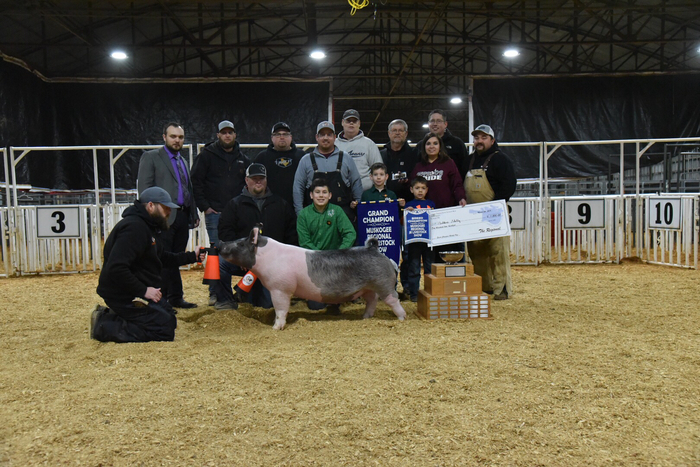 2019 Muskogee Regional Junior Livestock Show Grand Champion Market Hog. Sunday, March 10th, Spring Forward Daylight Savings Time Begins Set your clocks forward one hour. It is the slow pitch game that has been cancelled on March 14th. I said fast pitch in my original post. Sorry. The fast pitch softball game scheduled for March 14th has been cancelled. I am extremely proud of our senior Lady Warriors. They have had an outstanding basketball career. Now it's time to go to state in slow pitch! Good luck to the Lady Warriors softball team in their upcoming season. This is a message from Mrs.Olson: This will be the last week of Soft Seven after school. The local school competition will be March 13th. These "Race Offs" will determine our class winners and overall champions. 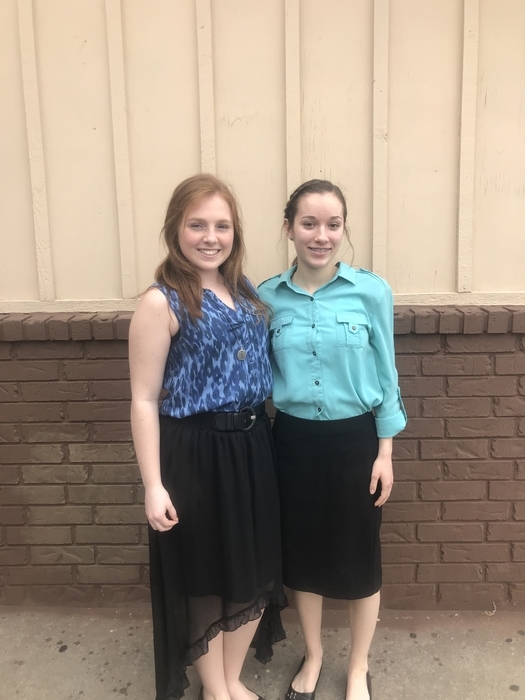 Overall champions compete at regionals in Sallisaw on March 30th. 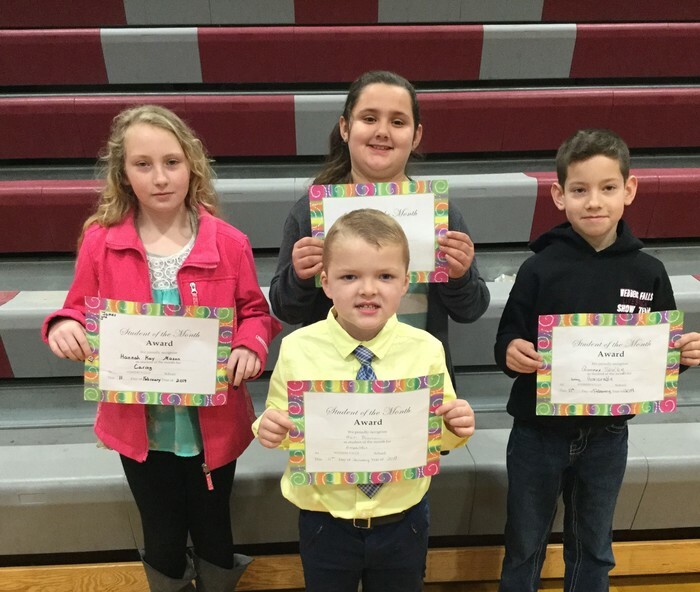 Congratulations to Caden Dishman, Daylan Jarrard, Haley Cato, Jake Chambers, Maddy Raskey, Madisyn Treadwell, and Maddux Shelby! These individuals made the Muskogee County Livestock Show Premium Auction. 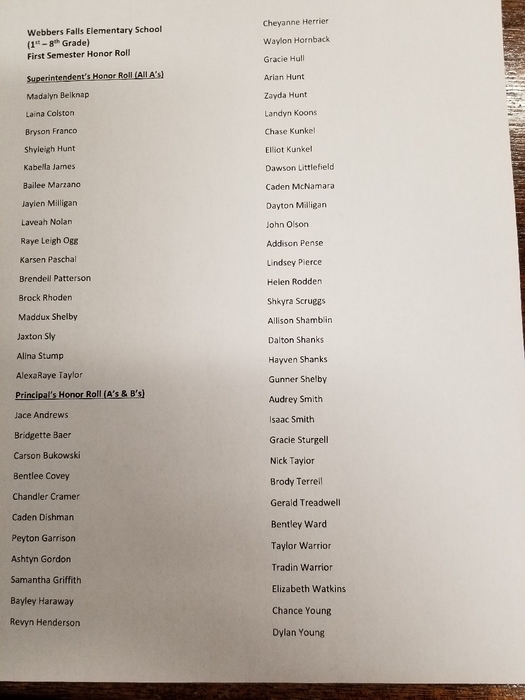 Congratulations to Samantha Storment and Madisyn Treadwell. They participated in the District Music Contest and will be moving on to the State Music Contest. I guess we will let someone else have the gold ball this year, but the Lady Warriors will be back! Ready to continue the journey! Headed to the Big House to pick up our gold ball. SOPHOMORES & JUNIORS: One lucky student will win a $40,000 Scholarship + a bonus $5,000 Tech Package! Eligible sophomores and juniors that register for the April, June, or July, 2019 US national test date (and opt-in to the giveaway during registration) has a chance to win the scholarship. It’s just that easy! Eligible students may also enter by mail. * Go to act.org/ACTScholarshipGiveaway to learn more. 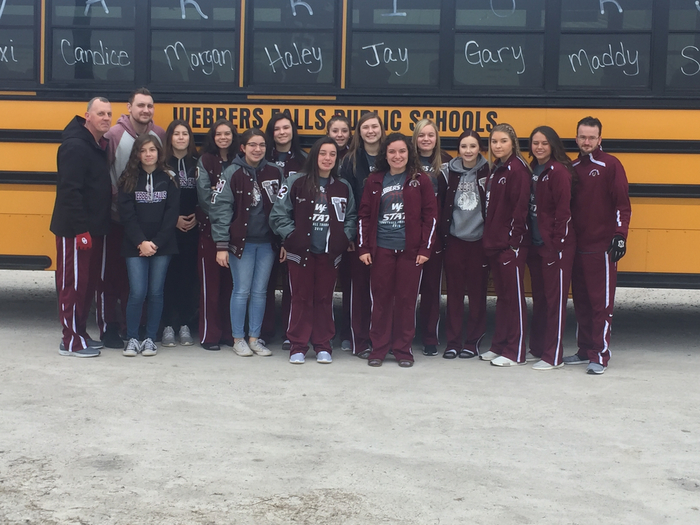 The Lady Warriors will be departing the school at 9:00 a.m. on Thursday morning. They will load the bus on the west side of the gym. 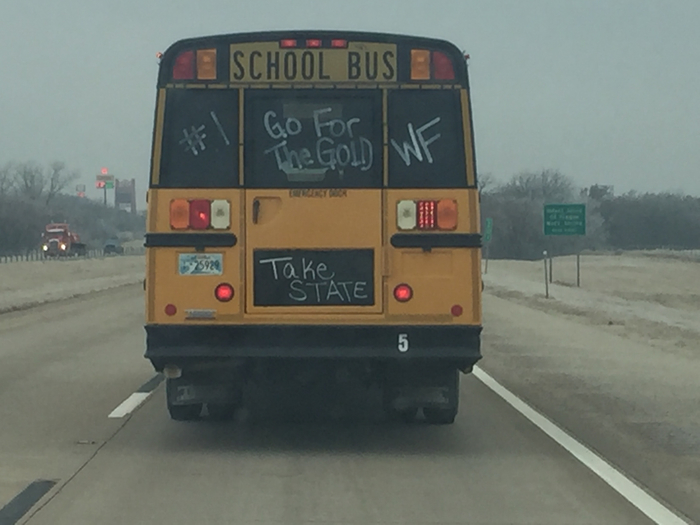 If you would like to be there for the send off or to take pictures, I would suggest being there by 8:30-8:45 a.m. Go for the Gold, Lady Warriors! 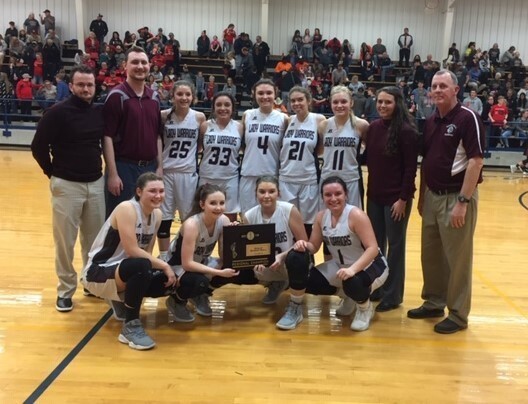 Congratulations to the Lady Warriors basketball team for being awarded the "Distinguished Academic Plaque" from OSSAA for having a cumulative GPA above 3.5 and being ranked in the upper 10% of all Class B schools in OK. They are outstanding students & basketball players! Congratulations to Ross McGuire! 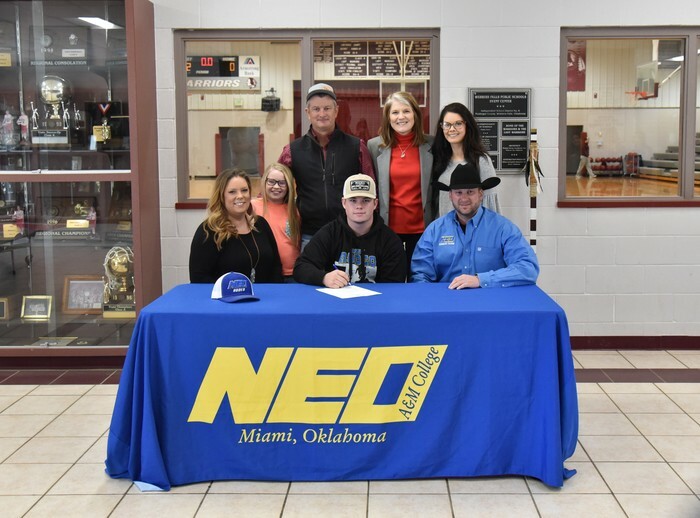 Today Ross signed a letter of intent to Northeastern Oklahoma A&M for a rodeo scholarship. SENIORS: Connors Scholarship deadline is March 1. Applications on connorsstate.edu website. SENIORS: Oklahoma Forestry Services Scholarships In an effort to reach out to the young men and women who are the future of forestry, the Forest Heritage Center Museum offers scholarships to college students and graduating high school seniors, as well as stipends for forestry program educators. Three opportunities are available, and the deadline to apply for all three is March 15. 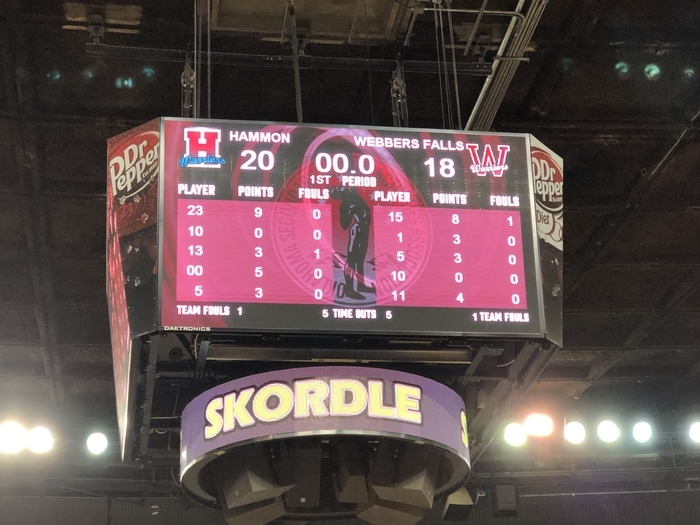 LADY WARRIORS ARE GOING TO STATE! 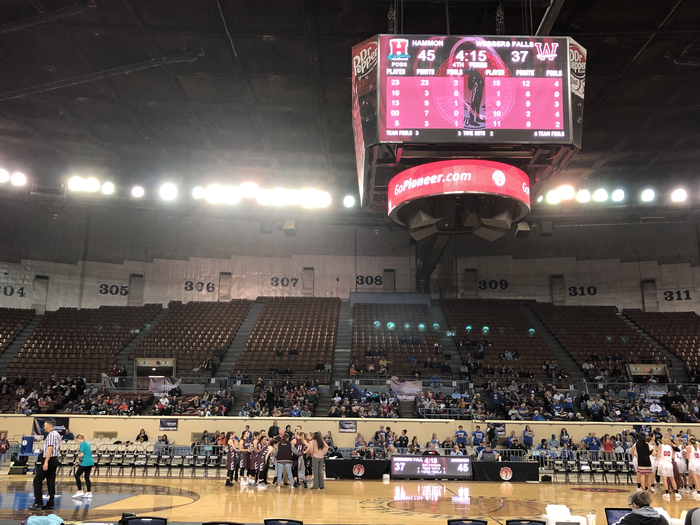 It has been 21 years since the Lady Warriors have made it to the State Tournament in basketball. 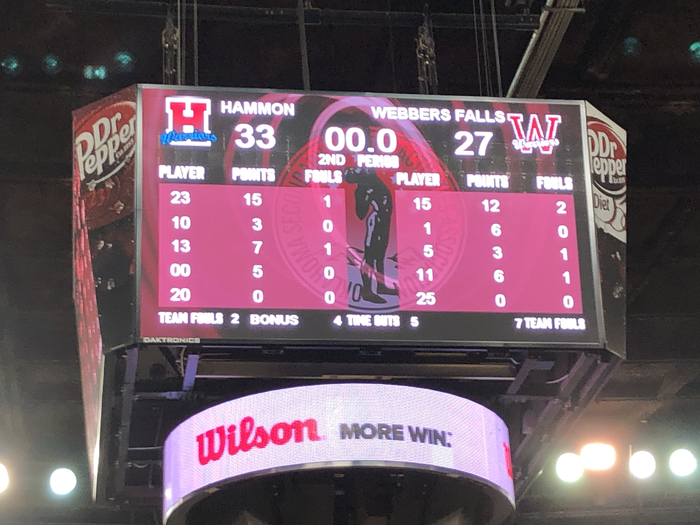 Webbers Falls Schools will be closed Thursday, February 28th, and Friday, March 1st in support of the Lady Warriors playing in the State Tournament. 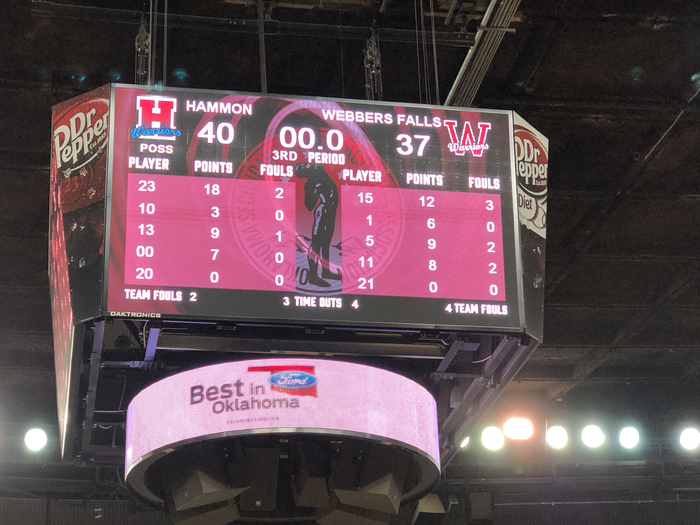 Thursday at 2:00 pm WF Lady Warriors will be playing Hammon Lady Warriors. Upon a game win, the next game will be Friday morning at 9:00 am between the winner of the Burlington/Boise City game. We will be providing a Pep bus for students of grades 5-12 who wish to attend the game. The minimum amount a student will need to attend, eat lunch on the way, and buy food or drink in the arena. Will be approximately $25. Ticket cost is $7. Minimum cost of lunch around $5. Food and drink in the arena will be around $5 per item. Your child will be responsible to keep up with his or her money. These two days will be made up on May 10th and May 17th. Please come to support the Lady Warriors. WARRIOR PRIDE!!! The Lady Warriors are going to State! 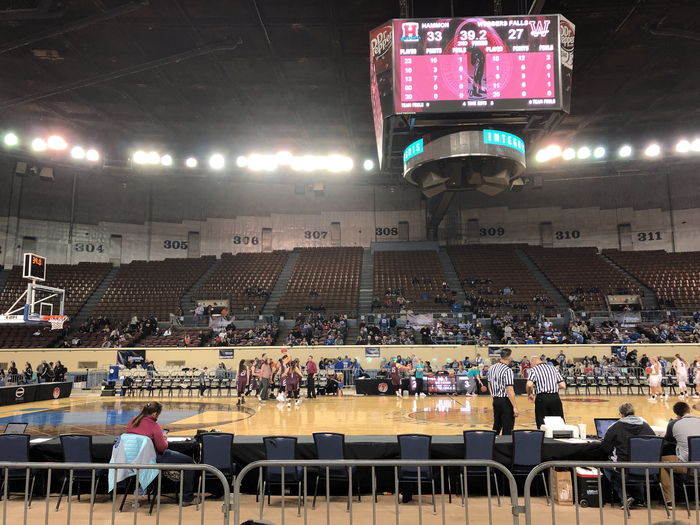 The schedule for this week's games is following: Girls Thursday at State Fair Arena Hammon vs. Webbers Falls, 2 p.m. Burlington vs. Boise City/Keyes, 3:30 p.m. Red Oak vs. Lomega, 7 p.m. Duke vs. Varnum, 8:30 p.m. Friday at State Fair Arena Hammon-Webbers Falls winner vs. Burlington-Boise City/Keyes winner, 9 a.m. Red Oak-Lomega winner vs. Duke-Varnum winner, 6 p.m. Saturday at State Fair Arena Championship, noon Please come support our girls. WARRIOR PRIDE!!! LADY WARRIORS ARE GOING TO STATE! WARRIOR PRIDE!!! 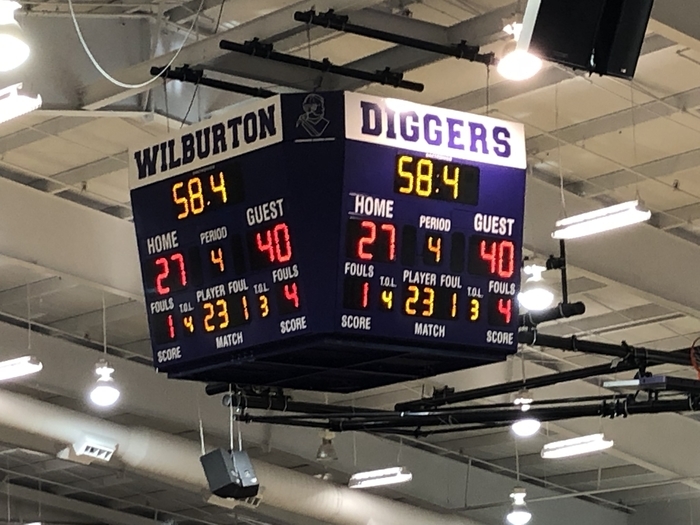 Lady Warriors are playing in the Area Tournament tonight at Wilburton High School at 6:30. Please come to support these fighting Warriors in their battle against Red Oak for Area Championship. 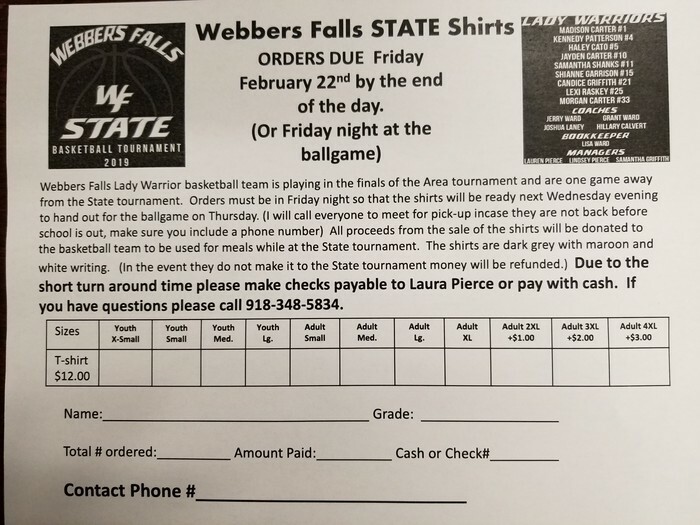 If our girls make it to State, we (actually Hillary Calvert & Laura Pierce) have pre-designed a fan t-shirt to wear next week at the State Tournament. 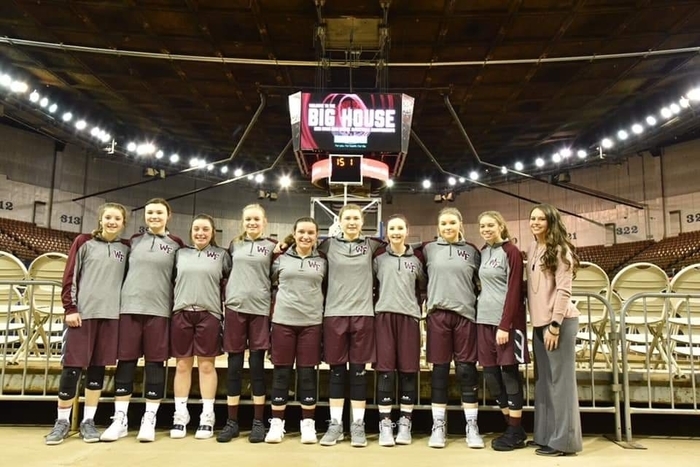 Our girls play Red Oak Friday night at 6:30, and if they win, they are State bound. If they lose, they will have a second chance on Saturday night. Please spread the word that the t-shirts are for sale. They cost $12 for sizes through adult XL. There is an extra fee for 2XL - 4XL as indicated on the order form. I will have order forms in my office today and tomorrow. Laura Pierce has volunteered to be in charge of ordering the t-shirts, but she needs the orders by Friday night if we win. I wanted to forward the design because on the copied order form you cannot see the outline of the maroon basketball. Lady Warriors! Regional Champions! WARRIOR PRIDE!!! Webbers Falls National Honor Society students made a visit to Gore Nursing Home to deliver valentines to the residents. This is one of their community service projects. Nice work! 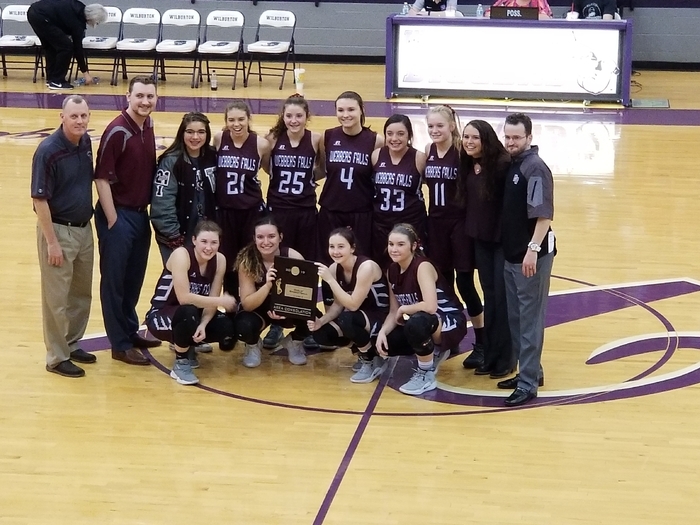 Lady Warriors, District Champs! WARRIOR PRIDE!!! District Championship games are tonight! 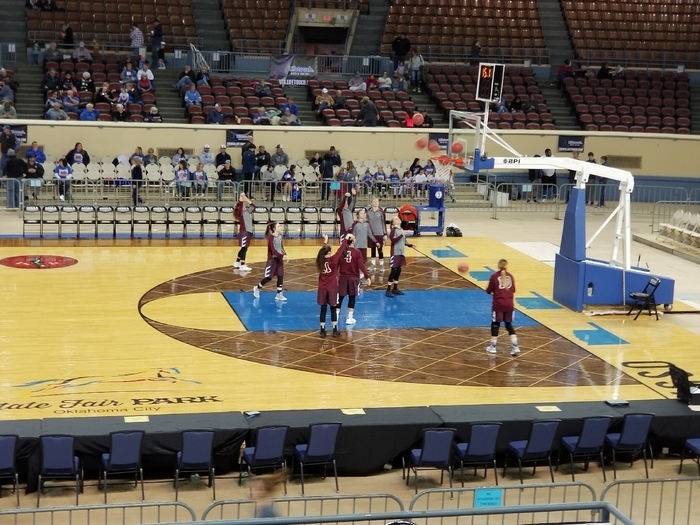 WF girls will play Stringtown at 6:30 & the boys will play after. Come support our Warriors! WARRIOR PRIDE! 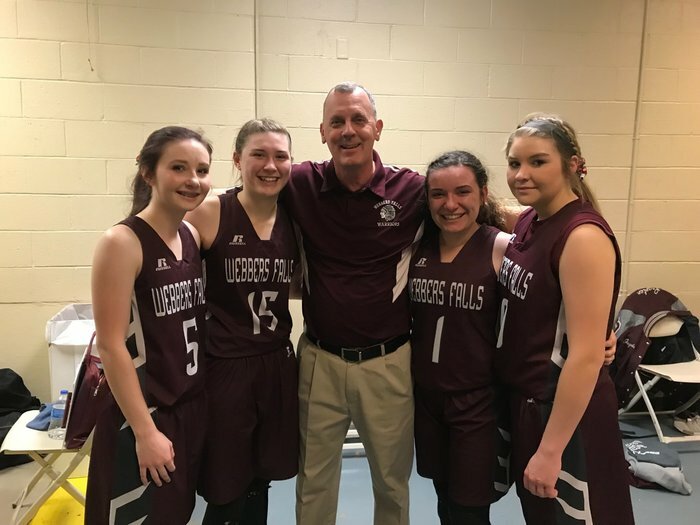 Webbers Falls is hosting district playoffs this Friday and Saturday (Feb. 8th & 9th). 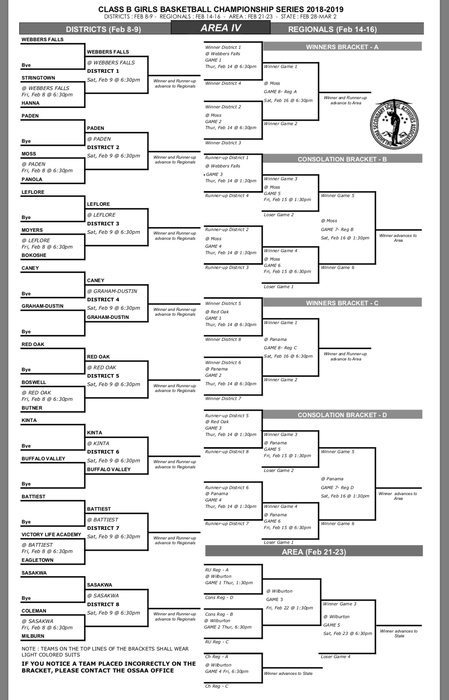 Our girls play Saturday at 6:30 p.m., and our boys play at 8:00 p.m. Come out and support our teams. Congratulations ti the JH Warriors, 3rd place conference tournament. 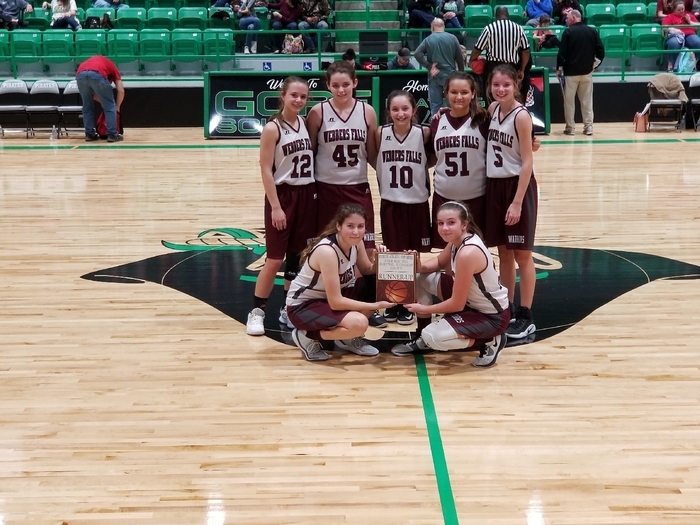 Congratulations to the JH Lady Warriors, 3rd place conference tournament. 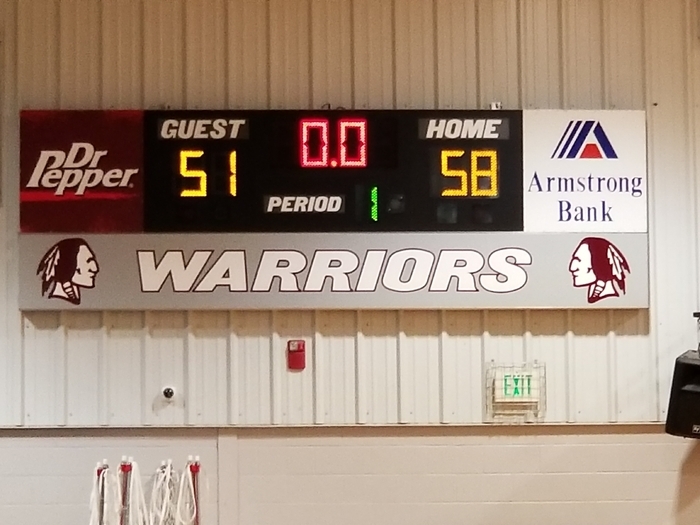 The Warriors got the victory over Porum, 57-56. 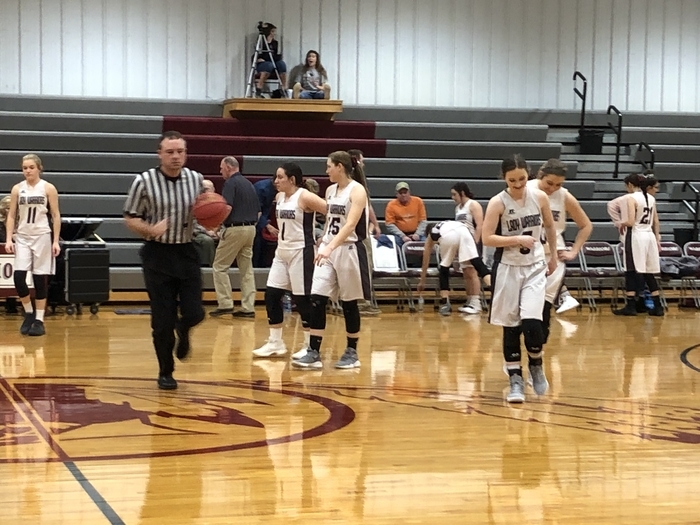 The Lady Warriors also got an impressive win over the Lady Panthers, 63-32. Congratulations to the players and coaches for two exciting victories. It was an entertaining night of basketball. 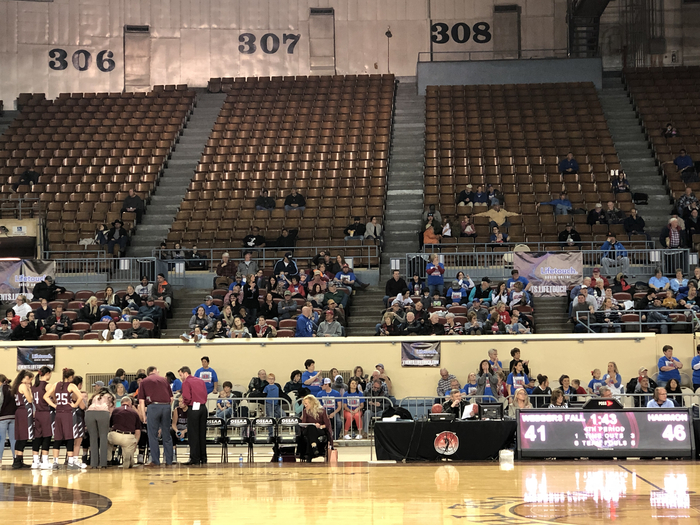 Thanks to the Warrior fans who proudly cheered us on. It was a great night to be a Warrior. Senior night tonight at 5:45 for Basketball, Baseball, and Slow-pitch Softball. Basketball games against Porum will start at 6:30. Senior parents need to be there by 5:30. Honored seniors are: Jayden Carter, Madison Carter, Haley Cato, Shianne Garrison, Jacob Coleman, Derrick Fieldgrove, and Noah Kittrell. 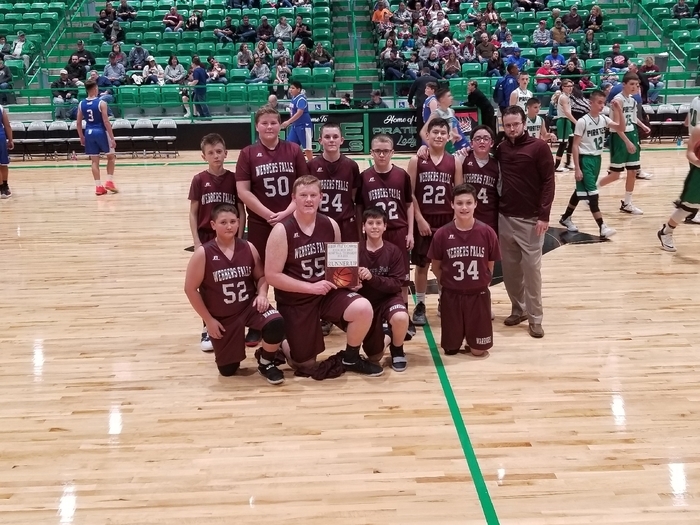 Both Webbers Falls JH basketball teams won Monday night in the first round of the Riverside Athletic Conference Junior High Tournament. 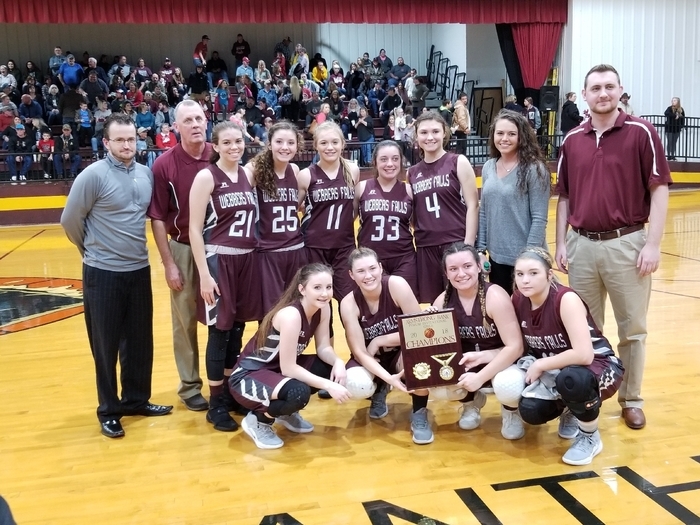 Our girls will play Porum Thursday night at 7:00 p.m. in the semi-finals game at Webbers Falls. 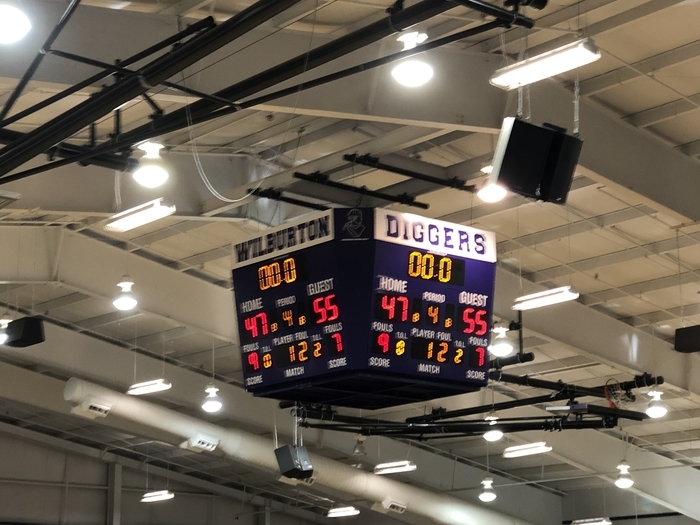 Our boys will play Arkoma Thursday night at 8:00 p.m. in the semi-finals game at Gore. The finals will be held Monday, February 4th, at Gore. Good luck to both teams! 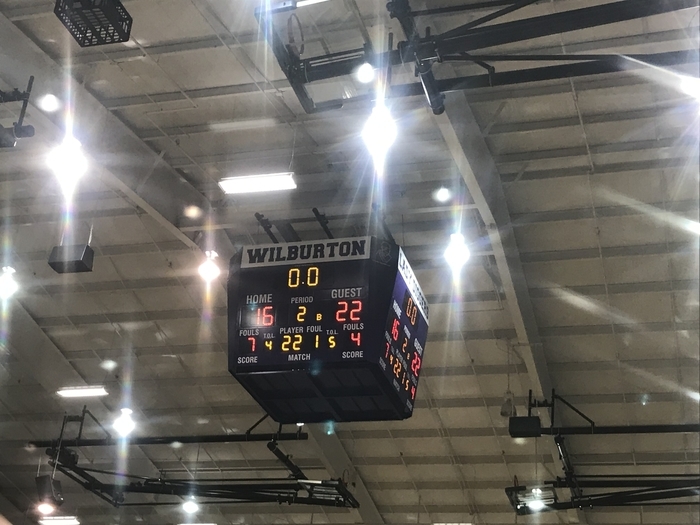 Webbers Falls JH Boys with the win over McCurtain. Congratulations, Warriors! I know this is short notice, but I just received this today. Great opportunity! 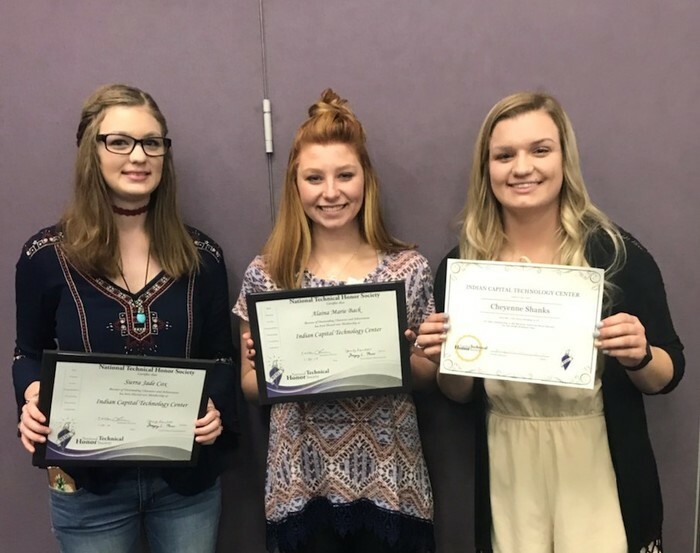 SUMMER FORENSIC SCIENCE CAMP FOR HIGH SCHOOL GIRLS: JUNE 1-10 Girls (grades 10-11 next year) apply here by January 30: http://business.uco.edu/computer-forensics-summer-academy/apply.html Teachers apply here by January 30: http://business.uco.edu/computer-forensics-summer-academy/teachers.html Want to solve crimes using forensic science? This is the experience for you! All expenses are paid and you can earn a little money, too. Each student participant will be paid. Funded by the National Science Foundation. Camp is held at the University of Central Oklahoma in Edmond. Apply NOW! Teachers – we need high school science teachers to facilitate with the students. Each teacher will have all expenses paid and earn $1500. We want YOU! SENIORS: Delphia Warren Leadership Scholarship will pay recipients $500 per semester for 8 semesters. Instructions for applying and a copy of the application is in the counselor's office. Deadline is March 10. Webbers Falls Schools will not be in session Thursday, February 14, 2019. We are hosting the first round of the regional basketball tournament. There will be a high volume of outside traffic and we are concerned about our students' safety. PK-4 will have their Valentine exchange at the end of the day on February 13th. Classes will resume Friday, February 15th. Webbers Falls Schools will not be in session Thursday, February 14, 2019, due to a high volume of outside traffic and the concern for student safety. PK-4 will have their Valentine exchange at the end of the day on February 13th. Classes will resume Friday, February 15th. 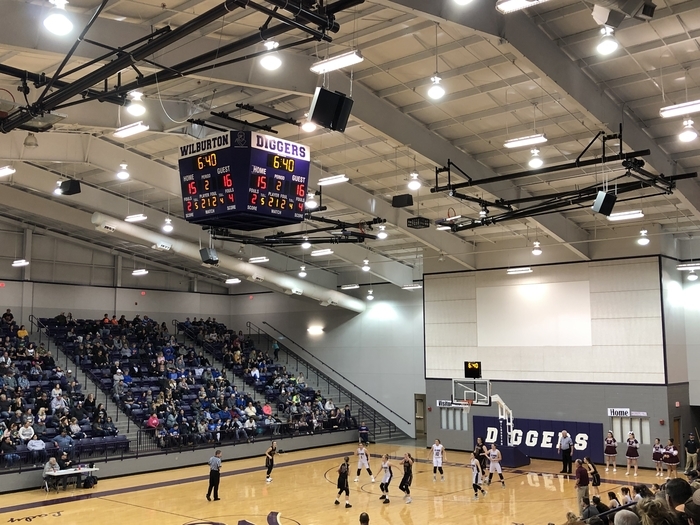 Correction: Tonight's JH Basketball games vs Arkoma at home have been cancelled. Thursday, January 24th. The local spelling bee for students in grades 1-8 will be held on Wednesday, February 20th, at 12:30 p.m. Prior to the spelling bee, students will compete by grade level for the opportunity to qualify for this event. The top three spellers in each grade will compete against each other at our local contest on February 20th. The top two overall finishers from the local contest will move on to the Eastern Oklahoma State Spelling Bee in Muskogee in March. Contact Mrs. Olson for more information or to register your child. 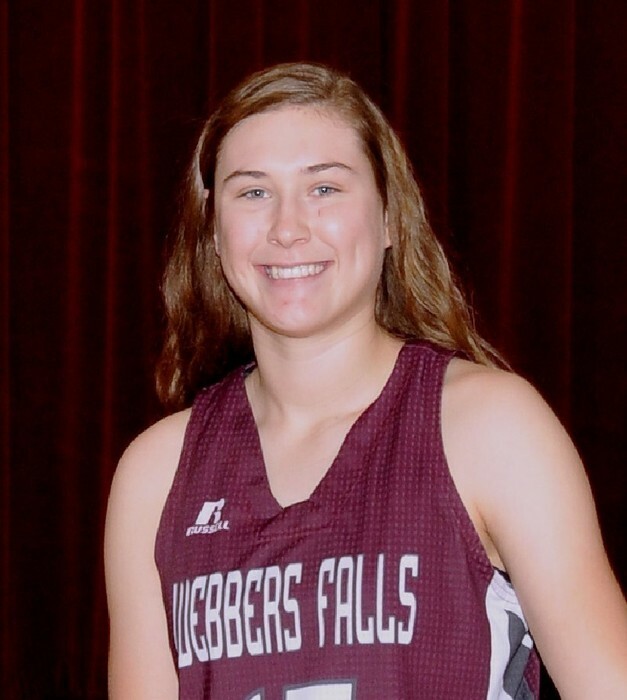 rolson@webbersfalls.k12.ok.us (918) 464-2383, Between 1:45 and 2:35 p.m.
Congratulations to Haley Cato for scoring 42 points in the Lady Warriors’ win over Oaks on January 21st. Haley hit ten three-pointers and was 100% from the free throw line. Way to go, Haley! 2019 Arkansas River Shootout Runner Up WARRIOR PRIDE!!! SENIORS: East Central Electric Cooperative is awarding one $1,000 scholarship to each school whose parents/guardians are members of their Cooperative. Students must possess honor, integrity thrift and good moral character. Applications in counselor's office. Deadline: March 1. 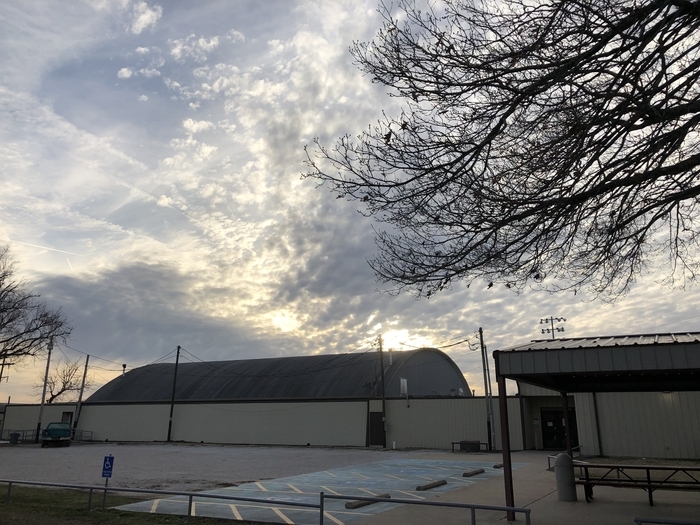 Tonight, Thursday, January 10, 2019 the Arkansas River Shootout basketball tournament at Webbers Falls begins. There are eight games beginning at 4 pm. See previous posts of the brackets. 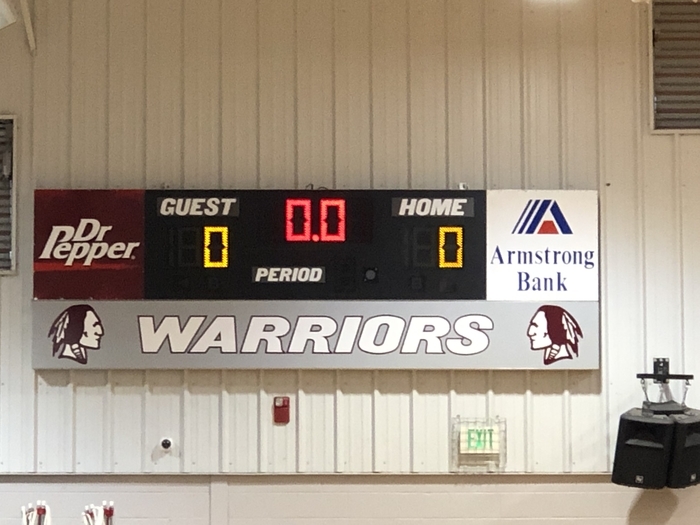 Webbers Falls Girls play at 7 pm in the new gym. The boys will play right after the girls. Sweet. 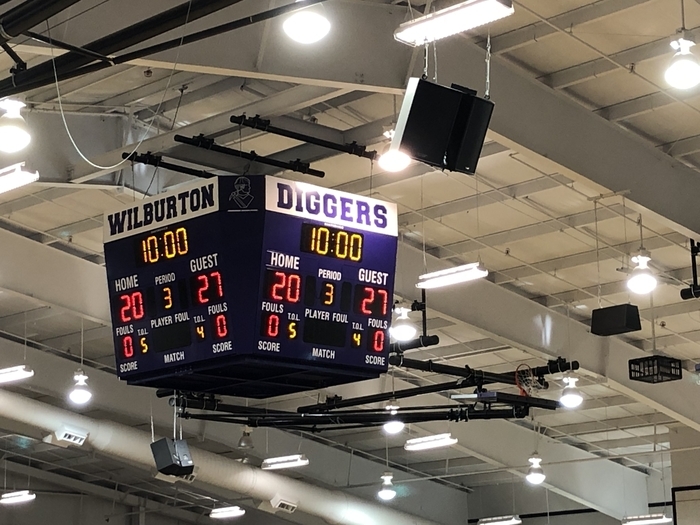 End of 1st quarter. WARRIOR PRIDE!!! Parents & Guardians of Webbers Falls Students: This call is to notify you that your child will receive his or her first semester report card on Tuesday, January 8th at the end of the school day. Teachers in grades K-2nd usually put the report card in the students’ folders that go home daily. Students in grades 3 through 12 are handed the report card and are responsible for bringing it home to their parents. We wanted to notify you in advance so you would know to check your child’s folder or ask your child for their report card when they get home. Thank you. SENIORS: Oklahoma Schools Insurance Group (OSIG) will award 12 scholarships, three in each quadrant of the state. Applicants will be vying for a $2,000, $1,500 and $1,000 scholarship. Only one applicant for each school is allowed. Applications are in Counselor's office. Deadline is March 1. Indian Capital Career Technology applications are in the councelor's office. Students need to get them now. Completed forms are due back to the counselor 2/1/19. Interviews will be 2/5/19. Saturday, January 5, 2019 River Valley Swine Jackpot 9 am - Cards due 10 am - Show begins Please come to support our students. WARRIOR PRIDE!!! 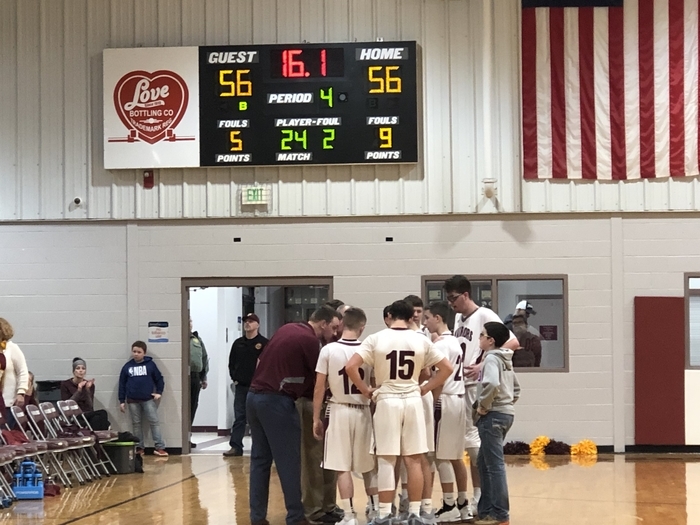 Events for the week of December 17, 2018: 17-Mon	PK-4 Christmas parties, 2:45 pm JH Basketball vs Keota @ WF, 5:30 pm, 2 games 18-Tue	Christmas Program, 9 am HS Basketball @ Keota, 6:30 pm, 2 games End of the Second Quarter December 19, 2018 – January 1, 2019 Christmas Break – NO SCHOOL 20-Thu	HS Basketball @ Watts, 6:30 pm, 2 games Please come to support our students. WARRIOR PRIDE!!! 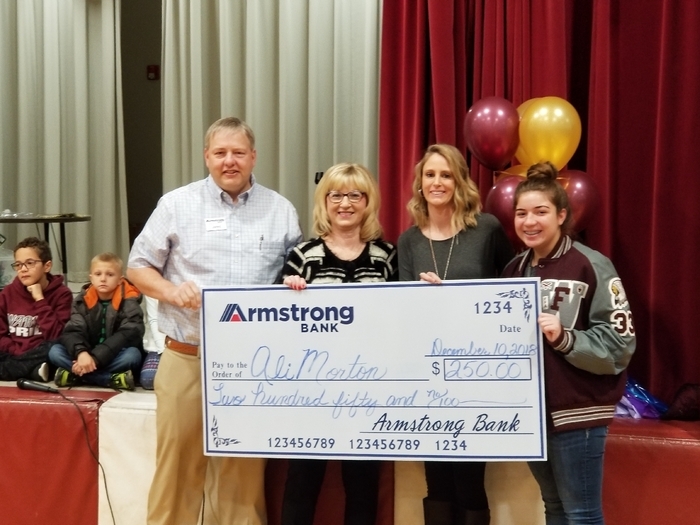 Congratulations to Ali Morton for being recognized by Armstrong Bank as a "Favorite Teacher." Ms. Moton was nominated by Lauren Pierce. 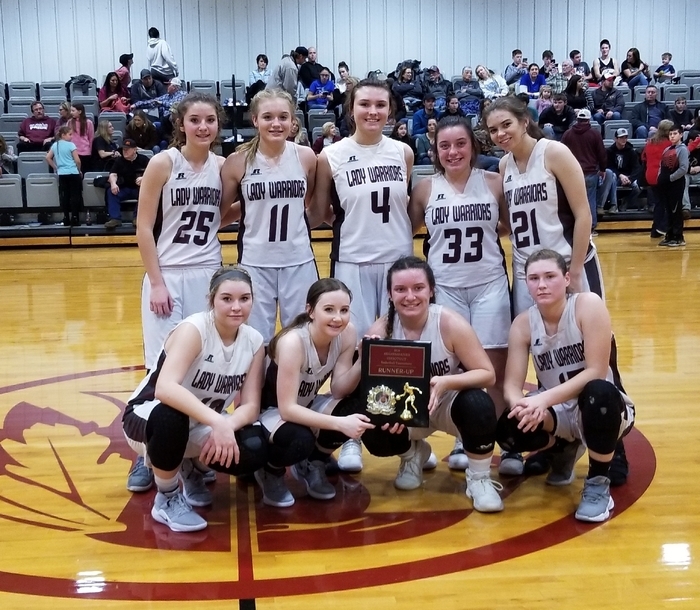 Lady Warriors, Porum Tournament Champs. 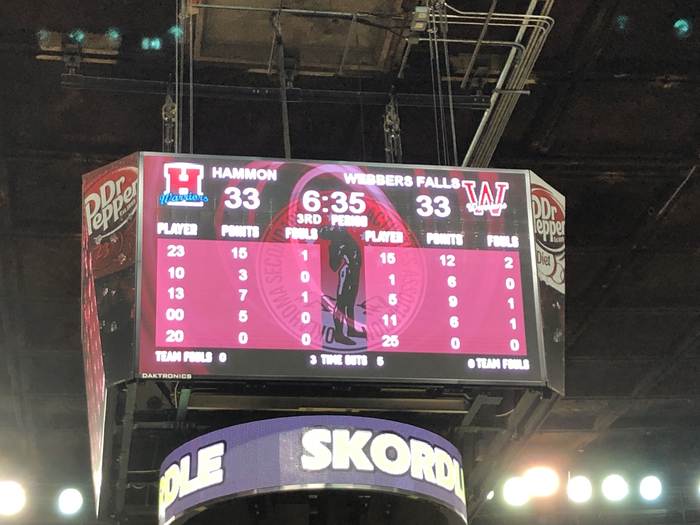 Lady Warriors 41, Porum 33. WARRIOR PRIDE!!! 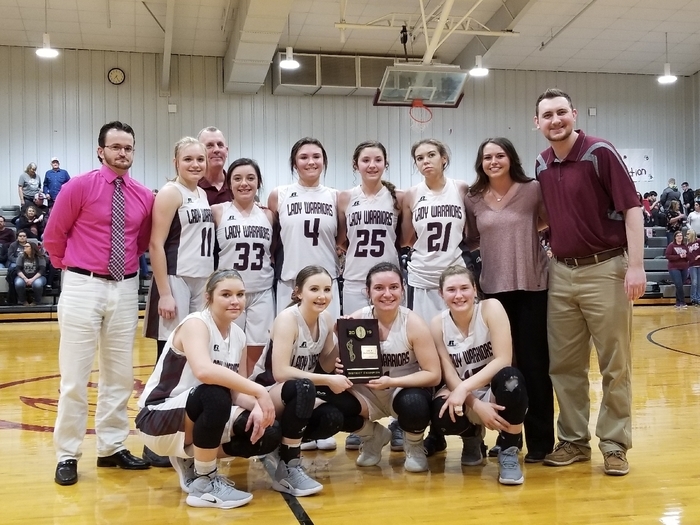 Ladie Warriors are in the finals of the Porum/Armstrong Bank Basketball Tournament tonight, Friday, 12/7/18, at 7:05. Please come out to support our students. WARRIOR PRIDE!!! 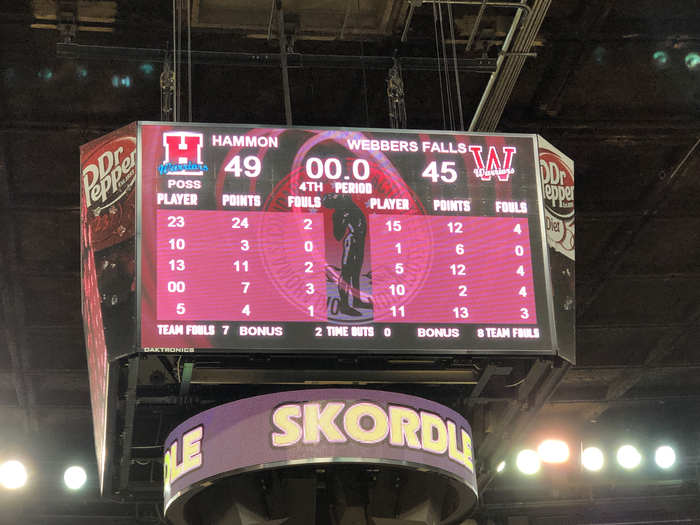 Lady Warriors 53. Whitesboro 39. WARRIOR PRIDE!!! Lady Warriors 63 Cave Springs 23. WARRIOR PRIDE!!! Due to the possibility of inclement weather, a change has been made to the Porum Tournament schedule. The game times will remain the same, however, the games will all be moved up a day beginning Wednesday. So: Thursday games will now be played on Wednesday. Friday games will now be played on Thursday. Saturday games will now be played on Friday. Don't forget! 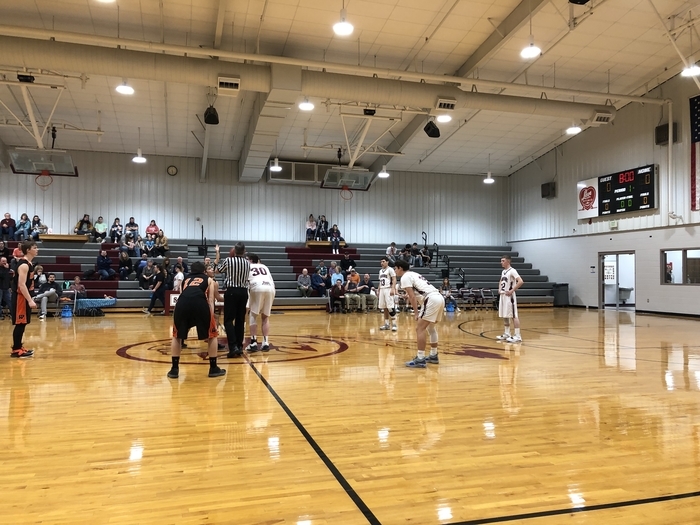 We've got a High School Basketball game at home against McCurtain at 6:30 tonight! At Webbers Falls Public School, our philosophy is to establish a firm foundation of which students build citizenship and gain skills valuable to themselves and society. Through a safe and positive learning environment, we provide opportunities for each child to obtain pride. The mission of Webbers Falls Public School is to promote a positive learning school environment, to provide opportunities for every child to gain knowledge, and develop skills that are valuable to the individual and society through cooperative efforts involving both school and community.